Since we are almost halfway through the season, I would like to start thinking about how ridiculously stupid the very first BCS Poll release is gonna be. 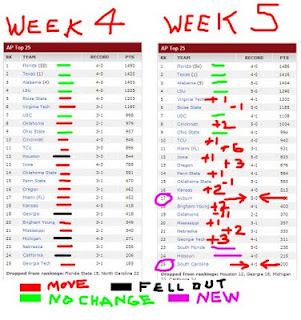 The way that I do that is totally ignore (for the whole season to date) any of the polls involved in the BCS metric. Usually, I just look at the APee trying to get in the retarded mindset necessary to produce lunacy. The one glaring APee darling in the poll right now is Cincinnati, a Big Least team. I honestly had to no clue that they were even a D-I conference. REALLY?!?!?! The sheer idiotic thing about Cincy being in the top fifty, much less the top ten, is that they are ONLY there to boost uSCCC. Check the two schedules, you'll see it, Oregon State, right damn there. uSCCC is so blatantly weak that teams from the Big Least get moved up the polling to help uSCCC stay in the points hunt. Pitiful. In case you were wondering, uSCCC is currently FOURTH in their own damn conference, yet ranked seventh in the nation, higher than any other PAC-10 team. At the very same time, Auburn, an undefeated SEC team finally cracked the top twenty-five. Silliness. And take a gander at Houston falling from the rankings, even though they have wins over Tejas Tech and Oklahoma State. Of course, they did lose to UTEP this past week. But, they do have a BYE week coming up in Starkvegas this weekend. At the risk of offending a regular reader, WTF is Oklahoma still doing in the top twenty-five? Their two decent opponents were losses and they beat two NOBODIES. Geez. Anyhoo, I am sticking with my prediction that it shall be uSCCC v. tOSU in the BCS Champeenshit game. Because they is who the pollsters want to see, they HATE footbaw. No offense taken. Speaking of offense, we might need a new offensive coordinator. Or something. Apparently, Barry wants to keep votes in both Califorlornia AND Ohio; hence, uSCCC and tOSU maintain their undeserved positions in the BsCS. Keith Olbermann's involved in this, somehow. Staci, really what is going on? I have not seen Okie play this year, but something is amiss and totally unexpected from me. Crazy. Skunkfeathers, The Four Letter fired Keith because he was an idiot, how can he eek back in and have some input? Because that is the obvious explanation for everything. Paul, Houston lost to UTEP. Not only did they lose, they gave up 58 points. To UTEP! They may as well have lost to The Garden Court Nursing Home Junior Varsity. What did Texas beat UTEP by...140 to 2 or something? A loss to UTEP is an automatic disqualification from ever playing in a high profile bowl game...no need to waste BSCS points on 'em. In defense of Oklahoma, they have lost two games by a total of two points. I figure the poll-boys figure that when they get healthy later on, they might get fixed into the mix of the BSCS Bowl dealie. The one that's REALLY got me scratching my head is Auburn. Sure, they haven't had a BIG GAME yet, but 5 solid wins (if you want to count beating the Vols by 4) should land them much higher. The other one that's got me scratching my head is my own beloved Tigers. I keep hoping against hope that these morons that vote in the polls know something about LSU that I do not. I doubt it, but "we live in hope." We gonna finds us out on Sattidy in Death Valley if we really have anything or not. Truthfully, I ain't looking forward to it. Andy, Houston has the number one offense in the nation right now. Sadly, they also rank 85th or worse in defensive stats. Which leads to rewrite the old saw into, "The best defense is a mediocre defense when you have the best offense." I still stand by my picks for the SEC winnahs, Geaux Tigers in the West and The Gates in the East. Well...if you say so Paul. But 'Bama is awfully good. But I appreciate your even higher hopes for my Tigers than I have. I've got a bad feeling about FL, followed up by Auburn, and then Saban two weeks later. And I ain't feeling real good about Ole' Miss the week after that...and I don't even want to think about facing stinkin' Arkansas if we lose 4 straight SEC games. But I'll take your optimism over my miserable experiences any year of the century. To tell you the truth, I don't know what is going on - but I really wasn't kidding about the new offensive coordinator thing. We haven't had a decent "corch" in that area since, say, Mangino. I think Stoops needs to can Wilson and give Josh Heupel the job. I just might dedicate a whole damn post to my Sunday quarterbackin' on the subject one of these days. Andy, it was a toss-up for me on Bammeroids and Geaux Tigers. I went with the Tigers, so I am sicking with it. If I didn't, that would be the sissy way out. Fingers crossed. Staci, I am looking forward to the post since you are a HOMER.